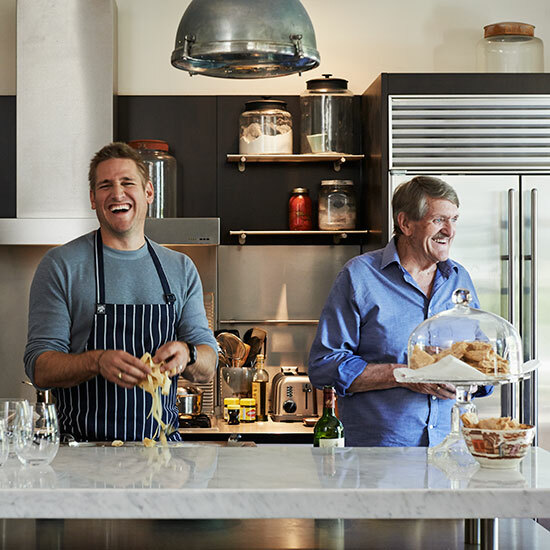 All Curtis Stone ever wanted to do was cook. Now, after years in the TV spotlight he's back in the kitchen, rediscovering what it means to be a chef. 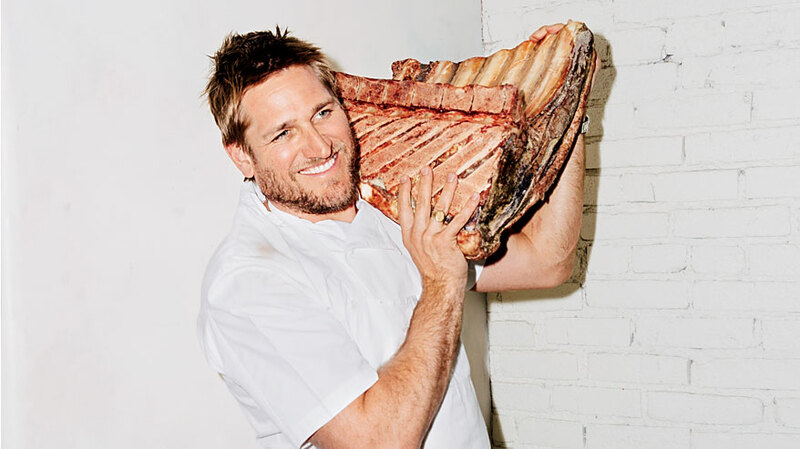 Even to Curtis Stone, the man he was reading about seemed like a fame-grabbing, empty-headed jerk. No mention of his cooking credentials, the apprenticeships in hotel kitchens like The Savoy Park Plaza in Melbourne, Australia, nor the years of 16-hour days working his way up through Marco Pierre White’s award-winning restaurants in London. A year after that Slashfood piece, Stone was sitting with his firstborn son, one-year-old Hudson, in a park near their home in the Hollywood Hills, when the “eye candy” comment floated back to mind. He cringed at the memory and the thought that his son wouldn’t know him as a real chef. Flash forward to 2017, and Stone is showing off a gleaming new glass-walled meat-aging locker at Gwen, the second of two acclaimed restaurants he’s opened in Los Angeles over the past three years. He’s done this while maintaining a full schedule of TV work, with regular appearances on everything from the Today show to the Home Shopping Network and a consulting job with an Australian supermarket chain; authoring two cookbooks; and fathering a second child with his wife, actress Lindsay Price (whom you may remember from the original Beverly Hills, 90210 and Lipstick Jungle). Stone's parents divorced when he was two, and his mother, Lorraine Coles, went to work at a florist’s shop to support her two sons, growing vegetables in the yard to feed them. “She sewed all of our clothes, tracksuit pants, underwear,” Stone says. Lorraine’s baking spurred an interest in food. At his all-male high school, he was the rare boy who chose to take home ec. He did a commercial cookery apprenticeship at a vocational school, worked in Melbourne restaurants and then, in classic Aussie fashion, shouldered a backpack and went traveling. At 22 in London, he met a cook who told him Marco Pierre White was hiring. By 2002, Stone was head chef at White’s Michelin-starred Quo Vadis, cooking for celebrities like Sean Connery, Kate Moss and Madonna. That Slashfood commenter wasn’t wrong: Stone is so good-looking—a 6-foot-2 hunk with sincere blue eyes, waves of Bondi Beach–blond hair and surfboard-thick hands—that it’s easy to assume he’s a made-for-TV confection. In 2002, when he was 27, he’d already begun appearing in kitchen segments on British morning TV. 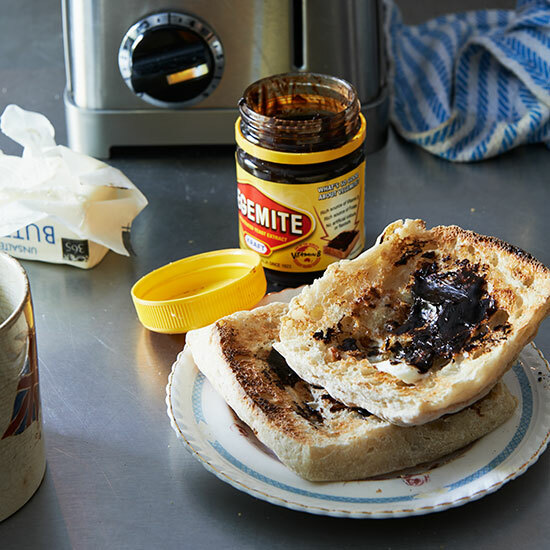 In one, with fellow Australian chef Ben O’Donoghue, they demonstrated hangover cures from Down Under (Stone’s: poached eggs with wild mushrooms on toast). BBC producers, swooning that one or both of the lads might be the next Jamie Oliver, created an Australian travel and cooking show for them called Surfing the Menu. By 2006, Stone was, for the most part, out of restaurant kitchens. His American breakthrough was Take Home Chef on TLC, a goofy series in which he picked up actresses and models at a Los Angeles supermarket, followed them home and went to work in their kitchens. And within a half-decade, it was like all that dues-paying in hot kitchens in his teens and twenties had been forgotten. Michael Voltaggio, a Top Chef winner who has managed to balance TV and food festival appearances with the demands of running critically praised restaurants, is one of those who has taken notice of Stone’s efforts to prove himself anew in the crucible of a hot kitchen. “For Curtis,” Voltaggio says in an email, “the ‘chef’ in ‘celebrity chef’ is what actually defines him.” Voltaggio isn’t the only one: James Robertson, who co-owns White’s two London restaurants and worked with Stone back in the day, is astonished at how hard he’s working now. “Every time I’ve seen him, he has been in chef’s whites, scrubbing down the stove at 11 p.m. with his staff,” Robertson tells me. Stone’s wife seems surprised by what restaurant work has meant to their domestic life. One morning, I sit at the breakfast table with the family. Price, who met Stone on a blind date seven years ago, is to audition for a role in a TV pilot that morning. As she cuts small pieces of smoked salmon for their two children, I ask about her husband’s work habits. “Emotionally it seems harder on him than on us, because he’s the one missing bedtime, bath time,” she says. As we leave for work, Stone stops in his garden to pick finger limes for the restaurant. Like his mother, he has rows of crops alongside his house. On arrival at Maude, he has the first of the day’s flat whites. Within the next few hours, as the energy rises toward the first seating, Stone’s tasks flip between duties as simple as sharpening a knife and as complex as deciding what Chelsea Handler will make during a taping the next day. Stone hears this. He knows this. But can he tear himself away again from the life that best receives and reciprocates his passion? That night at Gwen, I stay for dinner. At 5:25 p.m. sharp, a third flat white is handed to Stone, who works the meat-plating station, one of the most visible spots in the restaurant, about four steps from the roaring wood-fire grill that adds coziness to the Art Deco space. In front of him is the chef’s counter. To his left is the pass, where an expediter sorts tickets and shouts orders. The explosion of energy that’s been building up all day is upon us: thunks of butcher knives, squeals of shoe soles from quick-stepping waiters, thwops of uncorked bottles in the dining room, ping-klings of toasting glasses, roiling conversation ratcheting louder. Soon the expediter, standing at the pass in a showy Icelandic blue blazer and pink shirt, shouts: “You’ve got two pork, two shorty and an 80 on deck!” That means two patrons chose grilled pork (glazed cheek, grilled rack, smoked belly), two chose short rib (braised and grilled) and one splurged for the $175 80-day dry-aged 45-ounce steak, so fire them, mates! Stone’s business brain well knows the mundanities—that, for instance, the food cost of his rib eye is $17, it’ll take 45 minutes to cook and, if averages hold up, he’ll sell 20 tonight. These distractions can make it easy to forget that a restaurant’s success is more elemental than mathematical, less about business sense than sensuality. Our appetites are provoked and then satisfied in a way that’s hard to replicate outside the bedroom. Hours later, long after I’ve scooped up the last of my yuzu Pavlova, there stands Stone, sweating, taking thick steaks out of the oven, letting them rest, slicing with total focus, then sending them out into the swirl of the dining room. “Let’s go! Let’s go! Let’s go!” he shouts at one point, slamming his hand down on the counter to raise the already high adrenaline. When I leave, he is still there. Allen Salkin is the author of From Scratch: The Uncensored History of the Food Network.